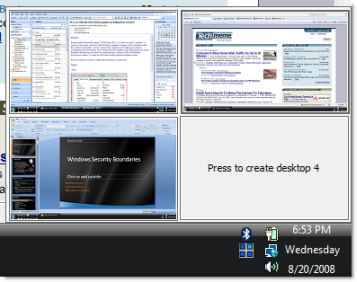 Microsoft’s Windows Sysinternals group has released a new virtual desktop utility called Desktops. If you have used virtual desktops on *nix or spaces on OS X you will feel right at home with Sysinternals Desktops. For those of you that are new to virtual desktops, they are a great way to organizing your work and help you multi-task better. Running Sysinternals Desktops is like having 4 monitors with 4 different desktops that you can have different windows or applications open on. You can easily switch between the desktops with your mouse or shortcut keys. I like to break up my tasks on different desktops. For example, I have Outlook open on virtual desktop 1 and my web developer apps like Dreamweaver and Photoshop open on desktop 2. When I am switching between different tasks I can just switch my current desktop view instead of minimizing and maximizing windows. This allows me to quickly switch between tasks without losing my window locations and setups. After you download Sysinternals Desktops and run it you will see a new icon in the system tray that looks like 4 blocks. If you click on the icon you will see a preview of what you have open on each desktop. 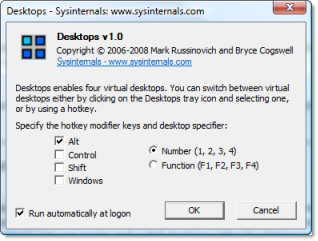 You can also right click on the systray icon and select Options where you can set the various shortcut keys you can use to switch between desktops.